Size: Size Select Size… 12 mm x 2.5 m 24 mm x 2.5 m 2 in. Used as a part of wound care, especially in patients with compromised delicate or sensitive skin. 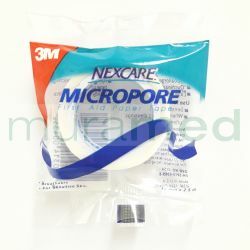 Micropore tape is a latex-free, hypoallergenic paper tape that is gentle to the skin yet adheres well and leaves minimal adhesive residue upon removal. An economical, general purpose, breathable surgical tape.